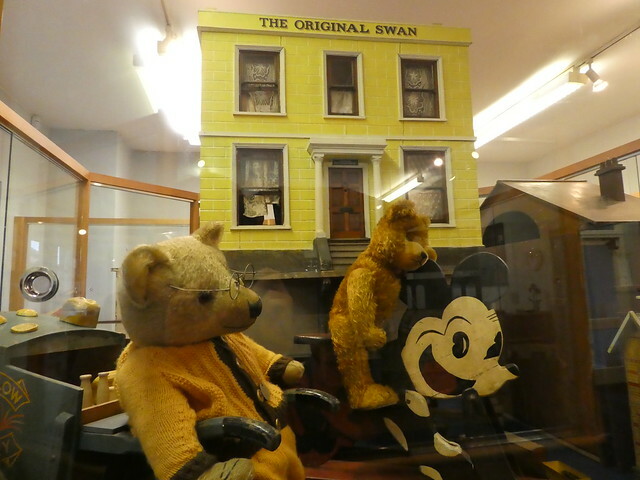 Tucked away on a side street yet only a few minutes walk from Ilkley railway station stands the Ilkley Toy Museum. This hidden gem has been located in a former Sunday School building in the attractive small West Yorkshire town of Ilkley for the past 16 years. The museum contains one of the finest private collections of toys and dolls in the north of England and after enjoying visits to toy museums in London, Edinburgh and Espoo, Finland we were eager to take a look at the items on display here too. 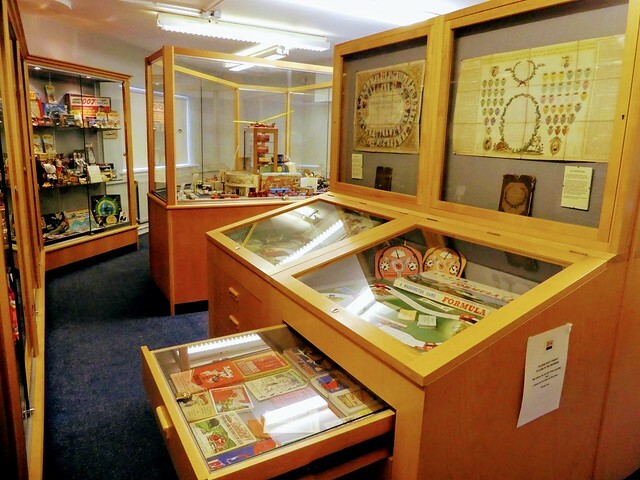 The Ilkley Toy Museum is generally only open to the public between 12.00 noon and 4.00 p.m. at weekends but school parties can arrange educational mid-week visits. 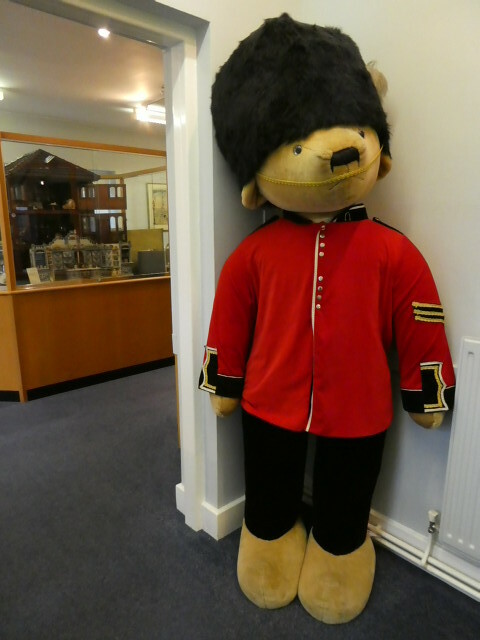 During opening hours a giant sized bear dressed as a policeman guards the entrance, his pockets filled with useful museum leaflets. Stepping inside, another large bear dressed as a soldier with a bright red jacket stands on duty near the ticket desk. Arranged in glass cabinets are a collection of toys representing a journey back to childhood for many visitors. We were particularly interested in a model fairground which was thought to have been made around 1950. This scale model comprises 21 pieces of which 12 are electrically powered. Visitors can operate this model fairground by purchasing a token costing 20p from the reception desk. Placing our token into the slot, we gazed in awe as the fairground swung into action and it was fun to watch the merry-go-round rotate and the swings swaying during the 45 second operation. 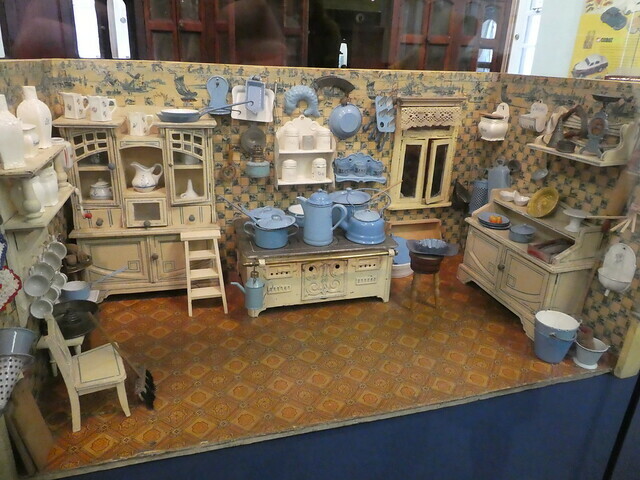 There’s a large display of Victorian dolls’ houses with miniature furniture and household items. The attention to detail is incredible with intricately painted porcelain and tiny pieces of lace edged cotton for tablecloths. One of the buildings, the Original Swan c1865-70 caught our attention, formerly in the Vivien Greene Dolls House collection, it was bought by the museum from a lady in Oxfordshire when it was in a derelict condition. The featureless dolls house has since been converted into an 1880’s country hotel with a period bar and other fittings restoring it to its former glory. Taking pride of place in the centre of the room is a large model railway bringing out the child in all of us. Along the corridor and pointing the way upstairs was another helpful bear, this time a traditional teddy bear sitting comfortably in a chair and sporting a red bow tie. 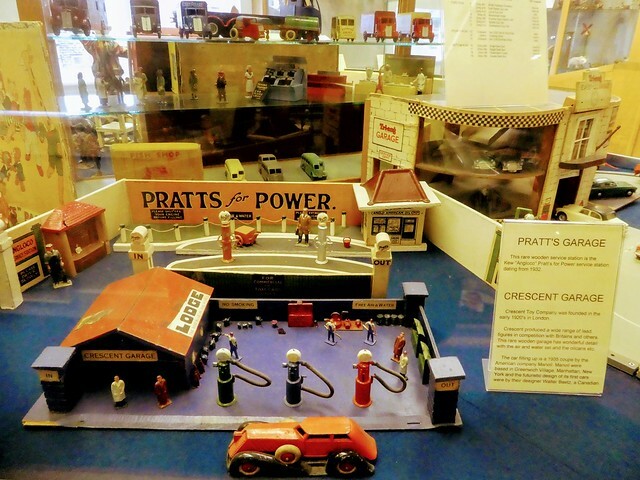 There are two galleries on the upper floor both full of fascinating exhibits in glass display cabinets and beneath them we found pull-out drawers packed with tin plate figures, small metal cars, wooden and paper toys. 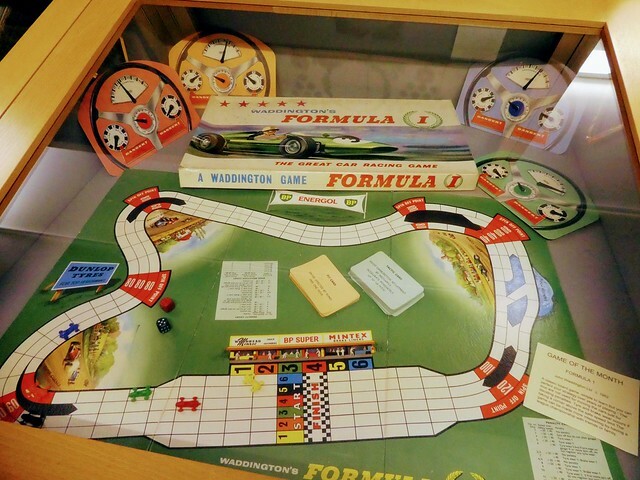 One of the games on display, a Waddington’s Formula One board game was familiar to us as an elderly relative has this in one of her cupboards. This game has kept our family amused over the years with its 1950’s racing car models and cardboard dashboards and hopefully it will continue to do so for generations to come. 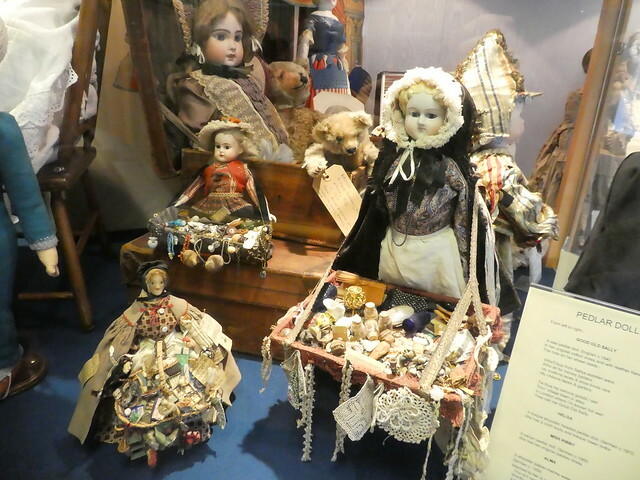 In the dolls’ gallery there is a beautiful display of early English wooden dolls, pedlar dolls weighed down with their big wooden trays filled with tiny trinkets and many other exquisite dolls through the ages. We adored Pratt’s Garage, a rare wooden service station dating from 1932. The Crescent Garage in the foreground has intricate detail with its very own wooden accessories including an air and water set. The car filling up at the petrol pumps is a 1935 coupe. Also on display is a 1980’s Paddington Bear made by Gabrielle Designs. Michael Bond wrote the first of his Paddington books in 1958 but it wasn’t until the 1970’s that Paddington gained popularity when he first appeared on television. In the photo Paddington is stood next to a Richard Steiff teddy bear whose German company are believed to have developed the teddy bear in the early 1900’s. Before leaving the museum we had a look in the small museum shop which stocks a range of traditional toys, games and jigsaws. As soon as I returned home, I went straight upstairs to say hello to my very own Paddington Bear which I received as a gift in 1980. He is identical to the one on display in the Toy Museum except that his felt hat is now perhaps a little faded from the sun. He still wears his original blue Dunlop wellington boots and looks smart with his red duffel coat. Sitting next to him is my much loved teddy bear Edward, who has been at my side as my dear friend for as long as I can remember. His coat is made from mohair and he has a growler sewn into the back of his body from which he can still manage a deep grunt if he is gently rocked. I wonder, do you still have dolls or teddy bears from your own childhood? If so, do please let me know who your favourites are! The Ilkley Toy Museum will be displaying a collection of their Victorian board games, dolls houses, toy soldiers and rare dolls at a Victorian Christmas at Harewood from 24th November – 31st December 2017. Harewood House is located 7 miles from Leeds and Harrogate and further details of the event can be found on their website. cute toys! old toys probably mean more to people. Good job author! The toys in the Ilkley Toy Museum were beautiful. I’ll take a look at your blog as soon as I have time! 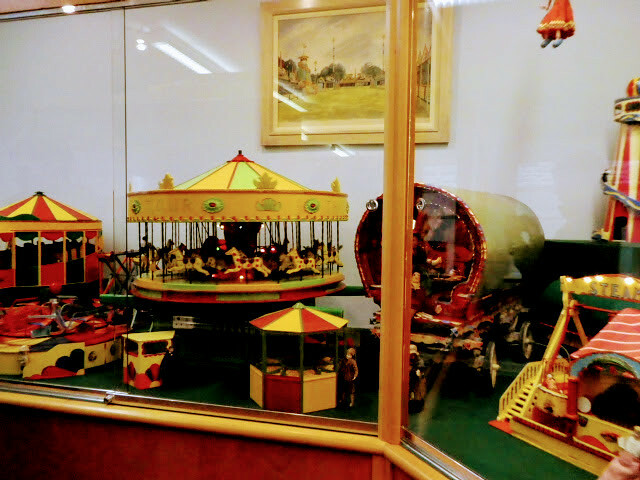 That’s lovely to read – The Ilkley Toy Museum is absolutely beautiful! Thank you for your kind words. It’s so good to read you are enjoying my blog. No, it’s impossible to keep everything but one or two precious pieces helps us to remember our childhood. Thanks again for your kind words. Love this– my great grandfather created the original American teddy bear in 1903 (named, of course, for president Teddy Roosevelt), which was the beginning of Ideal Toys in the US. I’m always drawn to toy museums, even vicariously! How marvellous to read that your Great grandfather created the original American teddy bear. Thank you for letting me know and for your welcome comments. I agree Suvi, I don’t know why Paddington had to change, the old version was much nicer. Thank you so much for your kind words. Pleased to read that you are enjoying my posts. So cute! Love the carousel! My mum had saved some of my childhood teddy bears and gave them to my boys now, washed and good as new! It was a nice reunion 😋💜 I’ve visited a couple of old toy exhibitions at museums in Helsinki, never visited the one in Espoo. I wonder if it’s permanent. There is a computer and game museum at Verkkokauppa, Jätkäsaari in Helsinki with oooooold computer stuff, if you are ever in the area! It’s best fitted for computer geeks (hubby went there and I tagged along) but it was interesting! How lovely that your Mum saved some of your teddy bears for your boys! The Ilkley Toy Museum is absolutely beautiful and I think that the one in Espoo is permanent. It is upstairs in the WeeGee centre in Tapiola. Have you experienced the new metro yet, hope they’ve made it suitable for twin sized prams!! Good idea!!! Thanks 😄 Will do! Great post! I especially like the doll house kitchen. Thanks for sharing. 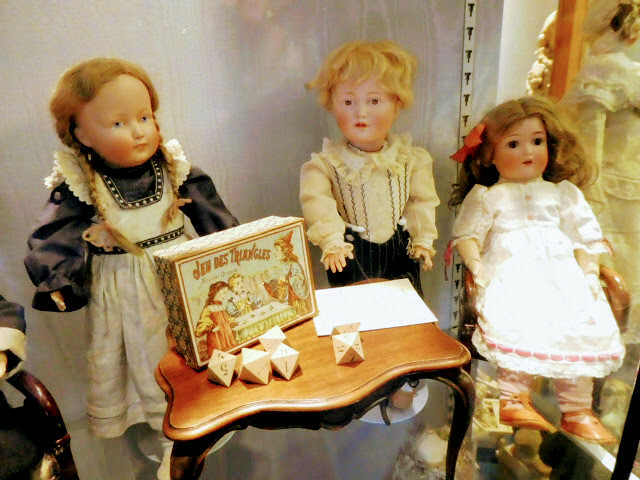 Thanks Sue for your kind words on the Ilkley Toy Museum, there’s some really beautiful old toys and dolls in there. This is the museum to my heart. Nostalgic – yes. 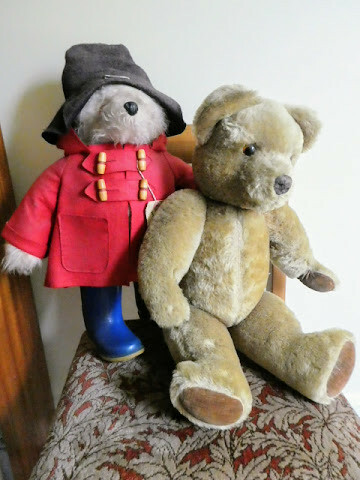 Memories – yes, because my daughter had Paddington, which we bought from London. That’s lovely to read Matti. I’m glad you also have a Paddington in your family. The museum is an absolute gem Jo and the town is gorgeous too, especially on a sunny day. It is a good place for children and adults too, so thank you for sharing! The Toy Museum is lovely for people of all ages, I hope you get an opportunity to visit one day. Gorgeous Marion; but those dolls look a bit scary. They do a bit, don’t they. I think I’ll stick yo my teddy! That’s true Ian. Thus is a private collection otherwise the same thing might happen here, too. I just love toy musea, especially the china dolls some of which look so lovely. Thanks for all the photos and write-up, really interesting. Thank you for the kind words. I’m pleased you enjoyed this post. If there are Dinky toys, Meccano or Hornby trains, you wouldn’t get me out of there! There were plenty of them! Thanks fir commenting. Thank you for taking an interest in this post. I do hope you have an opportunity to go there. Thank you Ravi for your kind words. I’m glad you enjoyed this post. Your travelogues are interesting Madam. I have liked them from my day 1 here. The doll’s house kitchen, the Teddies and Paddington Bear. Charming and delightful. Thank you for sharing this. It’s my pleasure Anne. 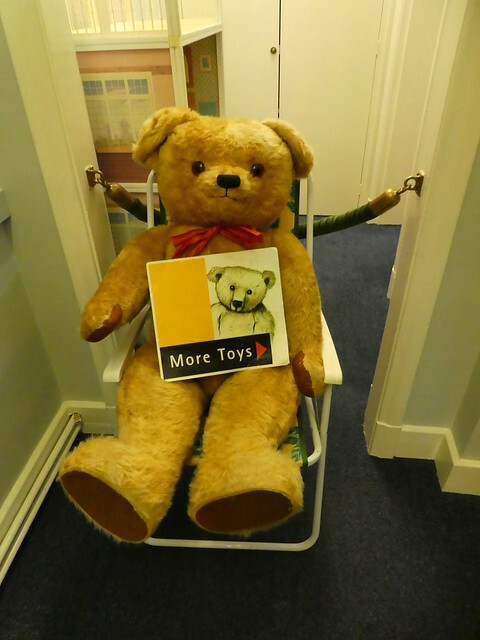 It’s lovely to read that you have enjoyed my post on the Toy Museum. This sounds like a wonderful and nostalgic place to visit Marion. I love old toys and especially dolls houses so think I could spend a very long time looking around…. 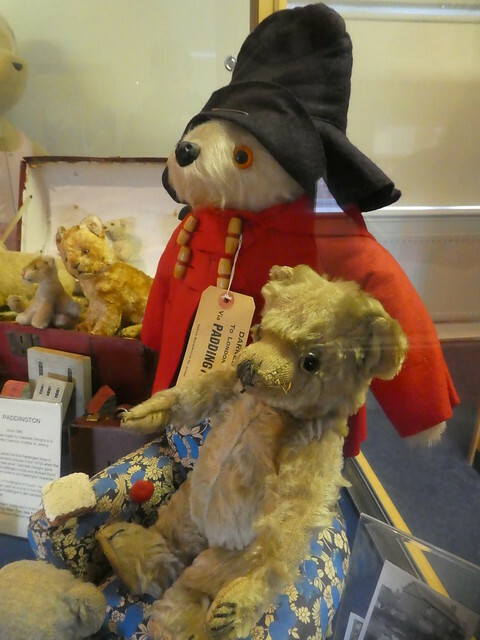 Your Paddington and teddy look like they are both in great shape! The Toy Museum is an absolute delight Joy. We loved every minute of our visit there admiring all the exhibits. My Paddington and Teddy Bear have surprisingly survived well over the years and I’m glad I kept them. What a wonderful post! My eldest daughter would just love the museum ~ she collected porcelain dolls as a child and still has her antique dollhouse tucked away. Thanks for sharing! How lovely to hear of your daughter’s collection Sandra. The porcelain dolls sound gorgeous.. I loved this post. I am a toy fanatic, I even wrote a blog on all my toys I have collected over the years, so I do have a lot of favorites. I love my Lite bright and of course my Teddy bears. I just picked up a great book second hand called Classic Toys of the national toy hall of fame by Scott G. Eberle. I loved looking through it with my family pointing out some of the toys we also have that we have picked up over the years, Thanks for sharing this museum trip. It would be nice to visit someday. Thank you for your lovely detailed comments, it’s so great to hear from you about own cherished toys. I hope you get to visit this Toy Museum one day. What a wonderful place to visit! I love the old toys. And I can’t believe that I used to have that Waddington’s Formula 1 game – O my lord! Thank you for your kind words and for learning that you also had that Waddington’s game. Have a good weekend. Delightful article. Thank you for sharing. It’s my pleasure. So glad to read that you enjoyed the post. Would be great to visit this museum. Thanks for the post! It’s a gorgeous small museum. So pleased you enjoyed this post. I still have a stuffed toy rabbit I was given for my first Christmas when I was just 4 weeks old. That was in 1975. She sadly no longer has her dress, but is otherwise intact, although a little worn. Great to hear about your rabbit Sarah and thanks for reading my post and your kind words. Thank you for your kind words, I’m so pleased that you also enjoy toy museums. hi! that looks interesting.. since you like travelling you should visit our website, check it out. Thank you for your kind words. I’ll take a look at your site too. The museum is great fun, thanks for your comment. Thanks Ingrid for your kind words. Glad you enjoyed reading it. Wow.. great post. How do you write so much!! Thank you for your kind words. Glad you enjoyed my post. The Toy Museum is absolutely gorgeous. Thank you for your comments.